You can dress up your little slugger in this adorable pair of short pants and matching hat set for those perfect pictures! The outfit will make a great memory just for daddy and a keepsake forever! This set can be made in almost any color combinations. If you would like a different color please note during checkout, otherwise, the set will be made with the same colors as in the main picture. This set is crocheted using soft, 100% acrylic yarn. It will stretch yet still keep its shape. This set is made to order. Please check my shop announcement for current turnaround times. If you need it sooner, please contact me so that we can work on setting up a rush order. Thank you to Cari at TuLeaf Photography for the amazing photos. 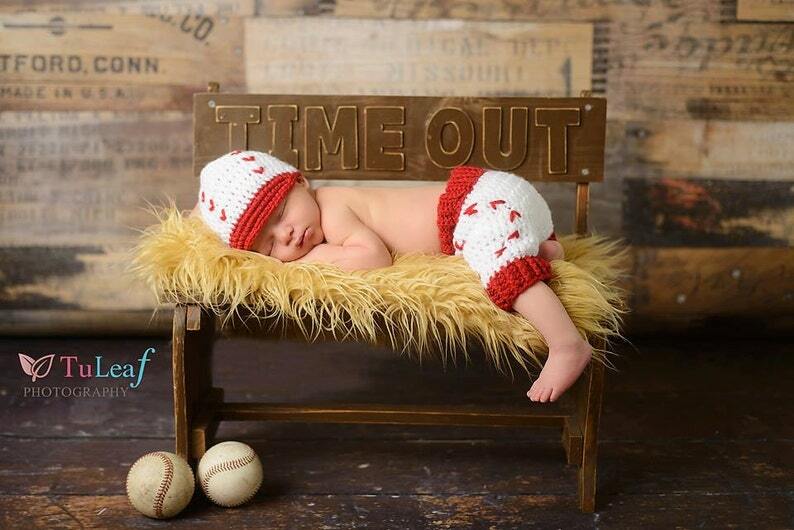 Order this for my newborn photo shoot, paid for 2-3 shipping. Package never arrive. Thank you to the seller for contacting USPS to sort out the missing package and for providing me with a full refund.